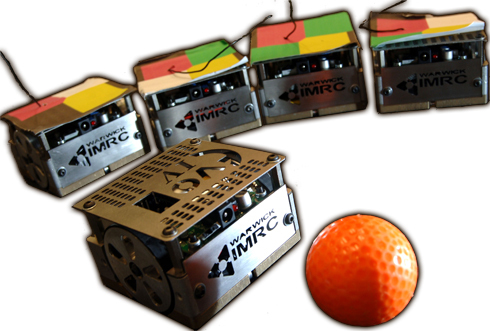 Previous teams have entered the robot football competition known as MiroSot, regulated by the global federation FIRA (Federation of International Robosoccer Association). The aim this competition is to produce a competitive team of FIRA certified robots, 7.5cm square. MiroSot is an inter-university competition consisting of 5 robots a side, using a computer controlled algorithm to calculate robot positions, based on data from a vision system. Last year we achieved 2nd place at the UK national championships and we are confident we can improve on this result in 2008. UPDATE: This year we managed to place first at the UK National MiroSot Championships, achieving our original goal. FIRA MiroSot is the Robot Football competition in which we participate. The concept is fairly simple, to get two teams of robots, with five robots per side, to play game of football completely autonomously. Each robot is limited in size to a maximum of a 7.5cm cube. The ball that the teams play with is an orange golf ball. Above the pitch is a machine vision camera running at 60 frames per second. This camera is linked back to a server which then calculates the positions and velocities of each of the robots and ball, from which it determines what each robot should be doing. These instructions are then communicated to the robots over a wireless link.